The iSeries Military Standard Waterproof Sennheiser EW Wireless Mic System Case from SKB is a compact, durable, and part of the iSeries Waterproof cases. 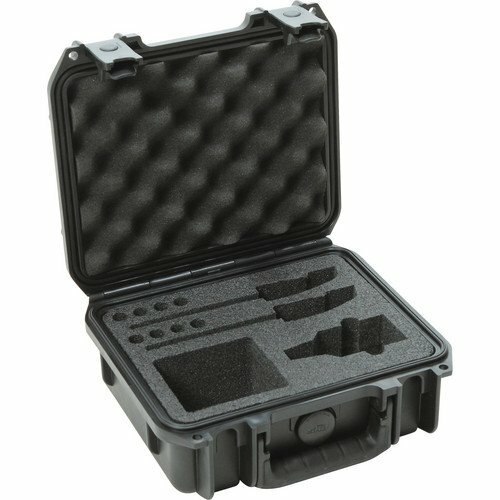 This injection-molded military-standard waterproof case is constructed from a high-strength polypropylene copolymer resin and features a gasketed, water and dust proof, a submersible (IP67-rated) design that makes it resistant to corrosion and damage due to impact. This case also features stainless steel molded-in hinges, a trigger release latch system, a comfortable snap-down rubber over-molded cushion grip handle, and an automatic ambient pressure equalization valve (MIL-STD-648C). The interior of the case features a custom-cut PE (polyethylene) foam interior that can accommodate a wireless plug-on transmitter, a wireless body pack transmitter, and a wireless body pack receiver with an extra spot for a lavaliere microphone plus additional accessories.